Calvin W. Gower, "Kansas Territory and the Pike's Peak Gold Rush: Governing the Gold Region," p. 289. Ralph H. Pickett, "Friedrich Von Holstein's Hunting Trips, 1865-1866," p. 314. Snell and Richmond, "When the Union and Kansas Pacific Built Through Kansas," (part 2), p. 334. 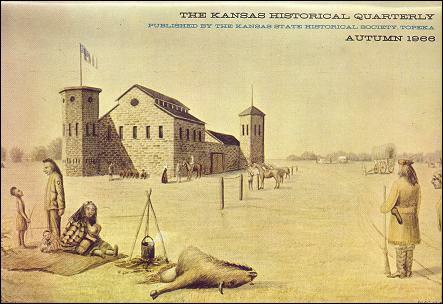 This water color of Fort Zarah (Barton county) on the Santa Fe trail was done by Henry Worrell, famed Kansas illustrator, in 1891. It purports to show the post, which operated from 1864 to 1869, as it appeared in 1864-1865, "looking west." There are now no visible remains of Fort Zarah. The painting was given to the State Historical Society in 1928 by Edna Reinbach of Spokane, Wash., a former Topekan.